How do I set up my mail list file? Using a standard graphic software program, such as InDesign, simply place one example of the variable text or graphic in position. When finished, print a hard copy of your file and circle all the variable elements, marking each with a descriptive name. These descriptive names will become the headers for your columns within your data file. The headers don’t need to be lengthy; they can be as simple as: Name, Address 1, Address 2, Image 1, Image 2, etc. Only use alpha characters, numerical characters and spaces in the header names. You can use any spreadsheet program, such as Microsoft Excel, to create your database as long as it uses standard delimited ASCII files that support normal tab or comma delimited files. The header row must be used to title the columns using exactly the same names you marked on the hard copy of your piece. When naming files only use alpha characters, numerical characters and under scores. Special characters (such as =, +, periods, etc.) cause errors. Keep names short, 13 characters or less. Place all of the variable elements within the spreadsheet. Each column in the spreadsheet represents a different variable field in the document. Each consecutive row contains the actual data for the finished document. When using variable images you only need to place the file name in the data fields. You must, however, use the exact file name of the image file. All images used in your database must reside in the same folder. Do not use subfolders. Send the document, hardcopy, database file, image folder and fonts to our prepress department. While preparing a document for variable data is relatively easy, there are some things you need to watch. The following is a list of DOs and DON’Ts. Whole point sizes are preferred. Partial point sizes (like 10.5) may require additional manipulation. You cannot use variable data within a single text box that has a text wrap applied. When incorporating variable data into text wraps, you must use a separate text box for the full width text and a separate text box for the indented text. When using this feature make sure to leave room for text re-flow. When creating your document, make sure you test the longest variable text field in each place it is used. This allows you to make sure your variable text fits in the allotted area. Check for text re-flow. Always check your documents for text re-flow. To use special effects on text, create the text in an illustration program and save the image as an eps or tif. Then import into your page layout program. 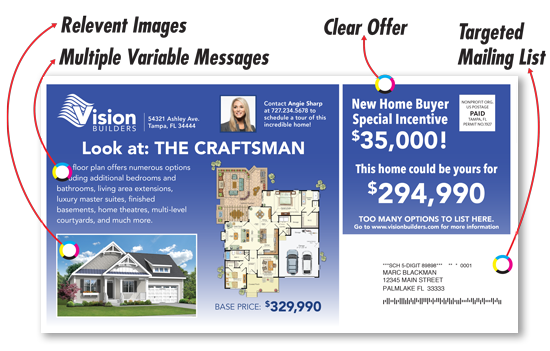 This pdf shows the ROI from two different direct mail campaign types. What is personalized direct mail? Learn more about database driven direct mail and increasing your ROI. Learn more about digital printing technology and our online customization workflow.